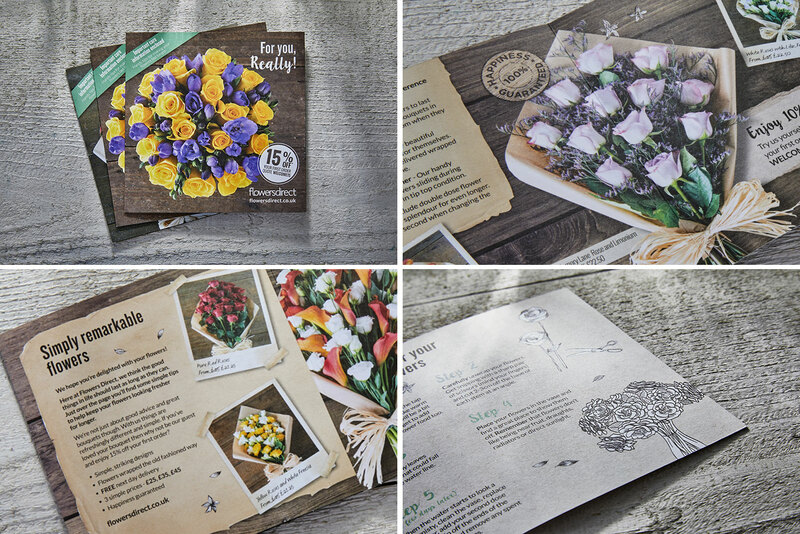 Having worked for Interflora for some years on their brand Flying Flowers, we were invited to help with the offline creative to promote the newly re-branded Flowers Direct. With stylish photography to work with and a clear offer of simple, striking designs at three simple prices, the offer was a promotion of a brand who wanted to make a statement. The bouquets are delivered wrapped in brown paper and tied with twine, Flowers Direct aim to stand out as being different from other flower delivery services and provide a more personalised looking service with traditional presentation. We aimed to place emphasis, through our creative, on the little things that make Flowers Direct different. We incorporated complementary natural wood imagery backgrounds, and introduced brown paper backgrounds with uneven edges and aged polaroid frames, adding to the overall rustic feel of the creative. With a key focus on striking bouquet designs, where the stems chosen were the focus of the bouquet, the addition of hand drawn floral elements and handwritten fonts added that extra little touch of personality to help illustrate the attention to detail. 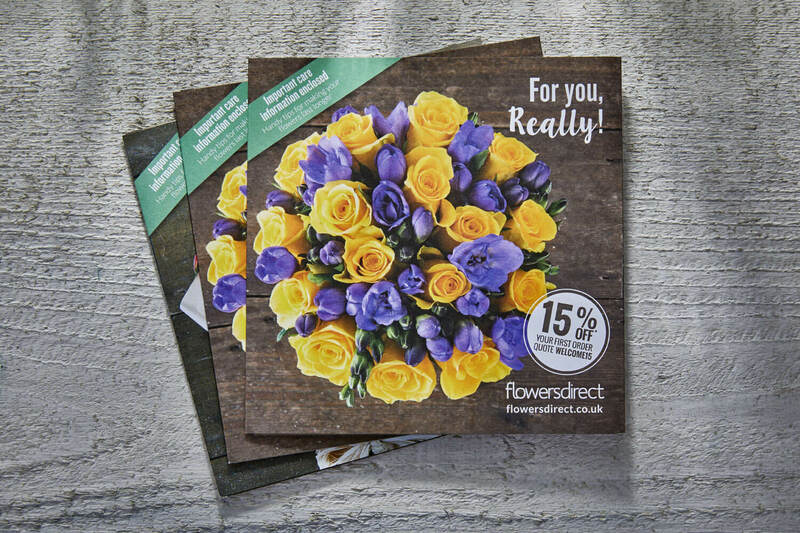 To assist stand-out, formats were key to the overall presentation, with a handy square format chosen for both direct mailings and recipient flyers, both also incorporating a separate offer card for the customer to keep for future use. 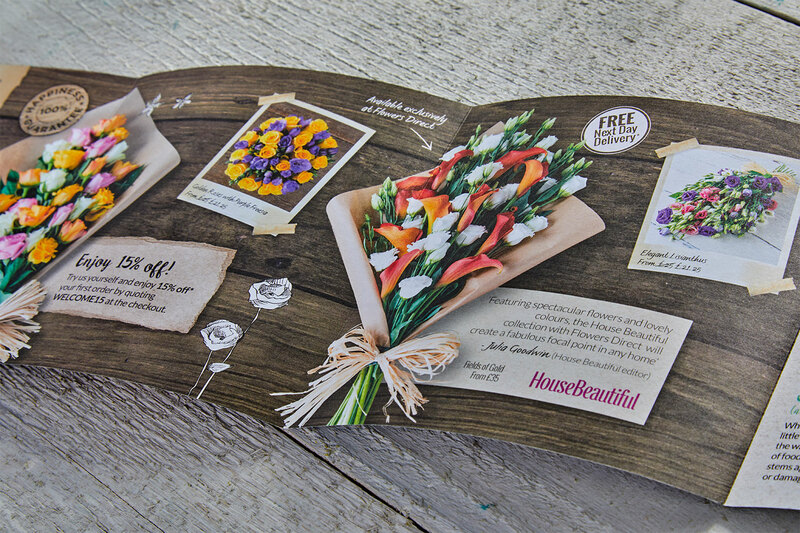 Printed on an uncoated stock for a natural feel, roll fold and gate-fold formats were chosen to catch the eye of the consumer and to ensure the bouquets could speak for themselves.